Not just a warm-weather destination, Barcelona in winter is still an amazing place for family fun. Many people say that the best time to visit Barcelona is summer time, but I’m here to tell you that Barcelona at Christmas time is worth considering. Come to Barcelona in November through January and you’ll find a dynamic city with more than enough to keep you excited and engaged. Here are a few reasons to visit Barcelona in winter…with kids or on your own. Why Visit Barcelona in Winter? The lights, the traditions, the food, and the energy. Exploring Barcelona is fantastic in any season. But we think visiting Barcelona in the winter a great choice. Come to Barcelona in November and most of the tourists have left. Stay in Barcelona in December and experience Catalan Christmas traditions. Here are a few reasons that make winter in Spain’s most popular city worth your while. Have You Been to Barcelona in Winter? Keiko and I are warm weather people. In fact, sunny Valencia was the coldest place we’ve lived since we left our life in Tokyo in 2013 to travel (we prefer Malaysia‘s hot and humid climate). That said, Barcelona in winter is fairly mild. The temperature almost never dips below freezing, even at night in January. And with 15ºC/56ºF daytime temperatures, you can save your fleece or heavy sweaters for after nightfall. During our most recent visit, our weather was patchy, but in general Barcelona in winter provides blue skies. Here’s a quick weather breakdown of Barcelona during the winter months. Highs of approx 18ºC/55ºF and lows of 9ºC/48ºF. Gets progressively colder throughout the month. Many overcast days and around 8-10 days of rain in Barcelona in November. Highs of 14ºC/60ºF and lows of 5ºC/41ºF. And very little rain. Most days are sunny, but low wind can make it feel cooler. It’s great walking weather in the day and then the Christmas markets in the evening. Christmas in Barcelona is great! Highs of 14ºC/49ºF and lows of 5ºC/41ºF. Daylight increases significantly throughout the month, with days at the end of the month almost an hour longer than New Year’s Day. A few days of light rain only. Highs of 14ºC/57ºF and lows of 6ºC/42ºF. Weather varies, with sunny days mixed with overcast and drizzle. Summer in Barcelona is packed. Visit Barcelona in the summer and you’ll see tourists from all over the world, but do you want to see tourists or do you want to see Barcelona? Places like La Rambla are thick with sightseers, and it can be hard to navigate. Barcelona in winter is another story. Sure, it’s still a big city and there are lots of people, but it’s much easier to see and do a lot more in a day. The time saved waiting in lines and navigating less crowded places adds up. Smaller crowds means that the Boqueria and other markets have more locals than tour groups, and you can wander through the Gothic Quarter in relative peace. Places like Parc Guel have long lines year-round, but they’re half the length in the winter time. If a late afternoon chill makes you want to step inside, Barcelona’s museums are a great place to pass the time. The Picasso Museum could take up half a day, as could the Joan Miro Museum. Cultural sites like Antonin Gaudi’s Sagrada Familia and Park Guell are still just as beautiful, but with significantly shorter lines. Places like Barcelona FC’s Camp Nou Stadium are crowded year-round, but you’ll be able to get closer to the trophies in winter. However, I still advise you to buy your tickets early. We all know the rules of economics 101: less people means lower demand. You can find some better deals in Barcelona during the winter, especially in accommodation. I’m not promising you that your bill at the tapas bar will be cheaper, but many restaurants have better deals, and with more low-season rates at hotels and other accommodation, maybe you won’t mind having another round of pinxos. Considering AirBnb? This link can save you money on yoru first rental! Things are happening all over Barcelona, all the time—from Jazz festivals and photo exhibits to talented buskers and other free performances. Sure, the crowds of summer mean there are more events organized during the warmer months, but visit Barcelona in November and you’ll find plenty to do. Or visit Barcelona in January or February and you’ll still find cultural events to enjoy. Another bonus for visiting Barcelona in winter is that you get to experience Catalan Christmas traditions. As you may know, Barcelona and the greater Spanish autonomous community of Catalonia is in many ways its own country (indeed, many in the country would like to be). Christmas in Spain is unique and special enough as it is, but in Catalonia, they have their own traditions that are fun to experience on your own or as a family. Visit Barcelona in December and you’ll see for yourself. Also, the Christmas season actually extends for many Spaniards well into January with the Three King’s Parade on January 6th so even if you visit Barcelona in January you can still catch a bit of a Barcelona Christmas! 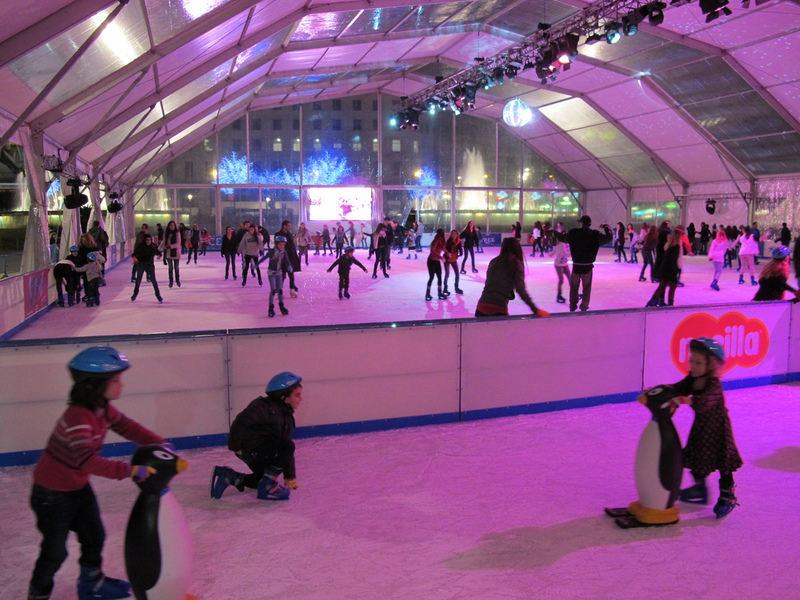 There are a number of places to glide across the ice when you visit Barcelona in winter. One of the most popular ice rinks is in Camp Nou, Barcelona’s famous football (soccer) stadium. If you’re even mildly interested in football/soccer or sport in general, you should be visiting the stadium anyway. As former long-term residents of Japan, we love the onsen (hot spring) experience. We’ve even tried one in Ourense, Spain! Barcelona has its own spas, and we know one particular spa that might pique your interest. Aire Barcelona provides a decadent Arab Bath experience with prices from 35 euros and up for the thermal bath treatment. We love going to thermal baths together, but this might be best experienced with one parent watching the kids while the other slips away. Barcelona is a party town year round, but on New Year’s Eve, it’s a party for all ages. Kids in Spain stay up shockingly late by our standards, but on New Year’s Eve, it’s a pleasure for all. Don’t forget your twelve grapes! This is a Spanish tradition where you eat twelve grapes at the chime in the new year. We found it a challenge to get the timing right and not choke in the process, but it’s fun! Brazil and New Orleans have the largest and most well-known carnivals. Yet this town half an hour from downtown Barcelona has a pretty great one, so if you visit Barcelona in February, consider a visit. It’s a great way to liven up the end of winter. Kicking off in late February or early March the Sitges carnival can have some raunchy elements and scantily-clad participants. Then again, what Carnivale doesn’t? You come to Spain to eat, right? Well not to worry. All of the restaurants and tapas bars will be open for business. Aside from the obvious traditional Spanish foods that you may know, here are a few special sweets that you and the kids must try when visiting Barcelona in winter. Turron is a traditional Spanish confection made from almonds, sugar, and other ingredients. The supermarkets have entire sections of it during the holidays, and there are dozens of varieties available in Christmas markets and elsewhere. Visit Barcelona November through February and you’ll see it everywhere. Derived from the Spanish word for “dust,” polvoron is an extremely crumble-prone shortbread. You can find these year-round, but like turron mentioned above, the amount and variety of polvoron available to you expands exponentially in Barcelona in December. Okay okay, so these are two separate items, but man-o-man do they go well together. Until we moved to Valencia, the only churros I’d ever had were stale ones bought at an amusement park. I didn’t know what the big deal was, but now that I’ve had a fresh Spanish one during Las Fallas, I get it. I totally get it. And can we spare a few words in respect of Spain’s hot chocolate? This isn’t a drink, friends. This is chocolate fondue in a bowl, and with a churro to serve as your spoon, you’ll be hooked from the first bite. When did you visit? Were you in Barcelona in November? Or did you visit Barcelona in December? January? What Barcelona attractions did you enjoy? Where did you go? Any good Barcelona restaurants or accommodation to recommend? Share your advice in the comments, or contact me directly! Disclosure: This post may contain affiliate links. This means, at no extra cost to you, we might receive a small commission if you make a purchase or book using those links. My opinions are my own and I only recommend places/services that I believe will genuinely help your travel to Spain in winter.